Located in Lakewood Ranch, Florida, MediaVision Solutions has been helping our customers realize the benefits of Internet-connected Digital Signage and Media for over eight years. Our solutions enable businesses to provide dynamic marketing and relevant information to one location, or hundreds, with the push of the button on any computer, anywhere in the world. If your business is ready to realize the benefits of digital signage, you have come to the right place. If you have to communicate with or inform anyone in your place of business, digital signage is a great choice. Here are just a few types of customers that benefit from digital signage. Digital Signage has already shown that it is cost-effective and adds an innovative way for bars and restaurants to improve the customer experience, communicate with their customers, and even connect with them on their social network. More and more bars and restaurants across the U.S. are embracing digital signage as the technology evolves, making it both more affordable and user-friendly than ever before. Have a look at some more ways restaurants can utilize digital signage. As more organizations evolve toward unified messaging, the use of digital signage to expand and compliment that employee communication is a great fit. Companies can use their digital signage network to disseminate corporate communications, advertise upcoming events, reward strong contributors, connect to the room scheduling database or in-room sensors to see what conference rooms are open or in us.... the uses are many and our hardware and services will allow you to clearly communicated with you employees and a centralized and effective way. 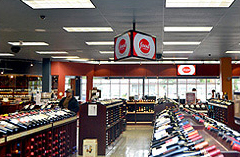 Digital Signage is very effective in a variety of retail environments. Displays can be placed on walls, tables, or in windows and used to showcase product, services, branding, and other types of marketing designed for your customers, or potential customers. Our systems can be integrated with mobile devices allowing viewers to control the signs, or take the information with them. Schools and Universities have been early adopters to digital signage. The dynamic and technology-oriented student demographic is a perfect for fit for this emerging technology. Digital Signage allows you to tap into the natural use of technology by K-12 and University students. Our platform can connect to social media APIs, integrate with mobile devices, help you communicate important dates to students easily, and much more. Gyms and exercise facilities can benefit from digital signage in a variety of ways. Whether it be a kids gym where parents gather to watch, or a gym where people go to workout, digital signage provides a way to communicate and entertain your members while they are at your facility. You can let your members know about upcoming classes, specials, and even give them a poll they can interact with on their smartphone. These locations are also a great venue for hyper-local advertising. Our digital signage network can be connected to our geo-location application! 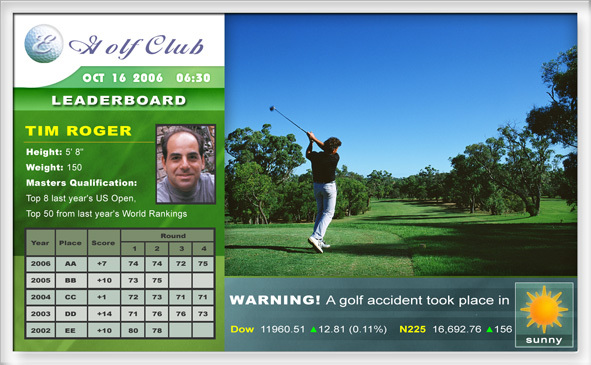 Golf courses are a perfect fit for digital signage. When placed in the clubhouse, digital signage can be used to advertise club specials, events, and even upcoming tee-times to keep your members informed. You can highlight your signature hole with a video or images and even include the weather forecast to keep your members dry and safe. In addition, it can tie into any scoring system to keep leagues and events up to date on who is leading. 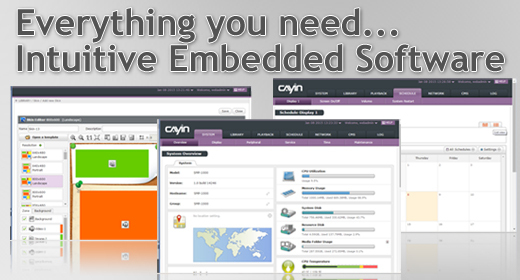 We are certified resellers for products that make up a typical digital signage installation. 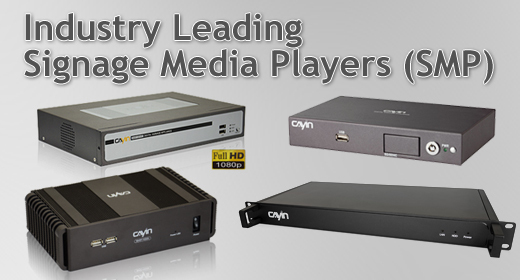 At the heart of any digital signage system is the media player. Our SMP line of internet-connected digital signage players are built on a mature hardware and embedded software solution. Our Internet-connected Signage Media Players have fifteen years of research and development behind them making them the best option for your project. The display is the most visible element of any digital signage project. This may seem obvious, however, often this is where customers look to save money. We sell an support many display options. There is more to a digital signage implementation than simply a display and a media player. The accessories you choose will not only determine what your display looks like, but how your content is distributed to your screens. We have over a decade of experience to help us mount your display and get the signal to it. We will get you up to speed, quickly. Whether retrofitting a system or engineering a system for a new build, we have the experience to manage the installation process for you. We are able to work with any facilities or internal resources on your project to determine the most feasible and cost effective approach. Not in Florida? No problem. We coordinate and manage professional installations anywhere in the United States. Our media players can be divided into multiple zones that may include things like images, HTML5/HTML, video, and Flash. As part of our Template Design package, we work with you to start a custom layout and program and your initial content. So, when you plug your system in, you already have content playing and now all you need to do is update the content. Often, content creation is an afterthought when rolling out a digital signage network. However, content is still king. It needs to be relevant to your viewers and look great. However, it still needs to be easy to create and affordable. We set you up for success by evaluating your resources and making recommendations. We can do it for you, or we can teach you how to do it yourself! One source, multiple screens. Because our media players support the newest web standards, viewers can see the same piece of content on your digital sign, your website, or their mobile device with specific formatting for each. Not to get technical (too late?) but the HTML can actually make up a zone on the screen! Interaction is a key to leaving a meaningful impact on your viewers. Our players support a variety of touch screens in any size screen. We support "kiosk-mode" out of the box meaning content can loop until a person touches or approaches your screen. We also can allow for mobile devices to interact with your screen (for example, through a window). We offer complete support for a hands-off experience which allows your resources to focus on your business. We can ensure a no worry experience so that all you have to worry about is what message you want to tell. Every digital signage project is unique. We would like to have the opportunity to discuss yours. No question is too small, and we love solving challenges. Let us know how we can help.